The gun epidemic has hit underserved communities of color particularly hard—gun homicide rates in these neighborhoods have reached a crisis point. Gun violence intervention programs have been shown to be effective at breaking the cycle of violence in impacted communities. Nowhere is the gun violence crisis more evident than in our underserved urban communities, where homicide rates often reach 10 times the national average. Young black men are especially vulnerable—the chance of a black American family losing a son to a bullet is 62% greater than losing him to a car accident. In fact, black men make up just 6% of the US population, but account for 51% of all homicide victims. Urban violence has too often been left out of the national conversation about guns, even though it makes up a huge proportion of the human toll of this epidemic. It is morally unconscionable that in the United States today we have neighborhoods with gun injury rates on par with active warzones. The good news is change is possible—and already happening in cities across the country. Research and case studies have shown that through a combination of low-cost, community-oriented intervention programs and much-needed firearms policy reforms, gun violence rates in urban communities can be cut in half in as little as two years. The solutions exist—we just need to implement them. Giffords Law Center has a team of experts dedicated to researching, promoting, and helping fund the programs and policies proven to save lives from gun violence in American cities. Our series of comprehensive reports on urban gun violence explores the depths of the problem and identifies how evidence-based solutions can be supported at the federal, state, and local levels. Are you a lawmaker or activist looking to support urban gun violence programs in your community? Email us at [email protected]. Member of the press with questions about urban gun violence? Email [email protected] to speak to an expert. 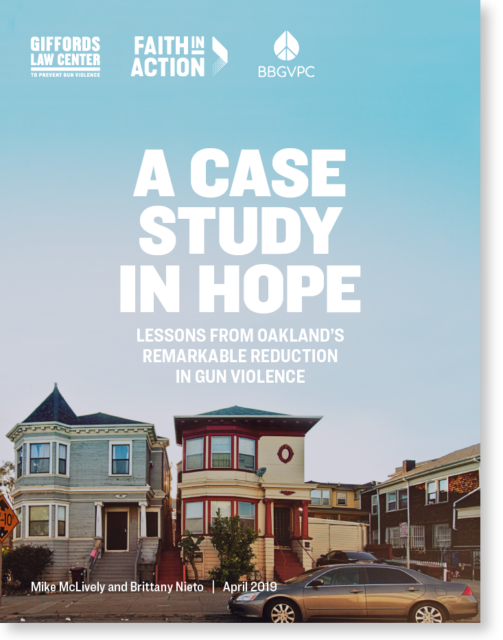 Our most recent report, A Case Study in Hope: Lessons from Oakland’s Remarkable Reduction in Gun Violence, explores how Oakland, once one of the deadliest cities in America, cut its homicide rate in half in just six years. By implementing a multifaceted strategy focused on data, collaboration, and community leadership, Oakland was able to save lives and stop shootings. A Case Study in Hope dives deep into Oakland’s success, and lays out concrete takeaways for other cities to implement in order to effectively prevent gun violence. Read the full report, our blog post detailing its findings, or an executive summary. Urban gun violence reduction strategies have proven remarkably effective, but in order to keep saving lives, these essential programs need consistent, long-term funding. 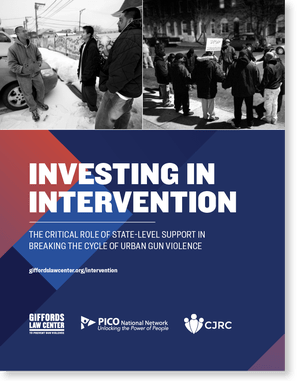 Investing in Intervention: The Critical Role of State-Level Support in Breaking the Cycle of Urban Gun Violence, highlights the approaches three states—Massachusetts, Connecticut, and New York—have taken to support urban gun violence prevention and identifies models for other states to follow in order to help reduce gun violence in cities. The cost to fund successful programs is relatively minimal—a few million dollars—compared to gun violence’s annual toll of $229 billion. Read the full report or download a factsheet of its key findings. Effective strategies for saving lives from urban gun violence exist, and have been tested in various cities across the country, with truly remarkable results, including a more than 70% drop in gun homicides in Richmond, CA. 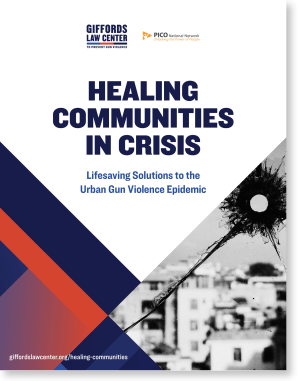 Our report Healing Communities in Crisis: Lifesaving Solutions to the Urban Gun Violence Epidemic examines the key strategies proven to reduce gun violence in urban communities: Group Violence Intervention, which identifies and intervenes with the small number of people most likely participate in shootings; Cure Violence, which treats violence like a communicable disease and connects those most at risk to social services; and Hospital-Based Intervention, which intervenes with shooting victims to break the cycle of retaliatory violence. Read the full report or download a factsheet summarizing violence intervention programs.